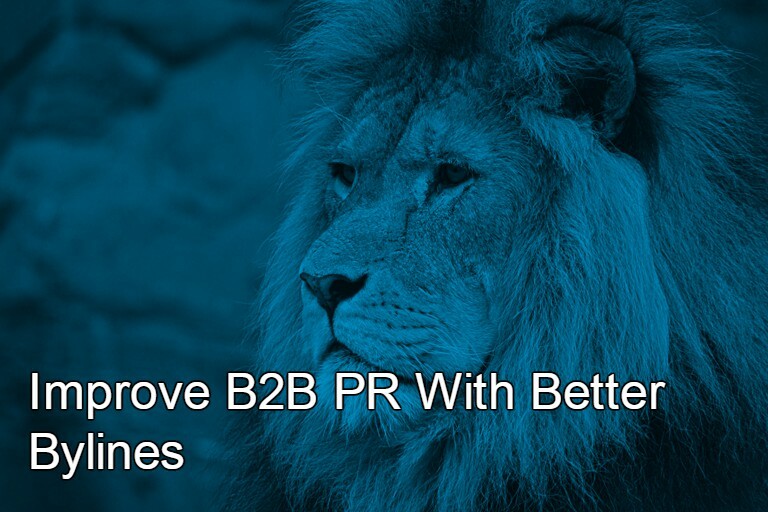 Timely, authoritative and well-written bylined articles – contributed pieces for business and trade publications – can elevate a B2B public relations effort exponentially, if executed correctly. How hard is it to write some short articles on a subject you know well? Harder than you think, if you want editors to consider your content for publication. And we’re going to use this opportunity to share some secrets to better bylines that will get published and be noticed by customers and prospects. Always start with editorial guidelines. Understanding what the decision-makers want before you begin writing is a major timesaver. Most online publications have editorial guidelines. You may have to search a bit to find them, but here’s a tremendous shortcut. The guidelines will typically cover the most important issues such as word count and how the publication prefers to receive submissions. Many prefer to receive a pitch and an outline first, though some will look at a completed article right off the bat. Following the editorial guidelines will streamline the process and improve the odds of publication, as discussed in a previous post on how to construct bylined articles. Write for the audience. It may seem obvious, but study the publication you’re pitching, and read more than one issue. This will offer insight into its tone, target audience, and topics. Although, as a rule, it’s smart to avoid jargon, bylined articles offer a bit of an exception. Because every industry has its own language and terminology, to write like an insider may require the inclusion of certain terms. In adtech we talk about “viewability” and “monetization” – deadly to those outside the industry, but considered hot-button issues by many inside it. Try this simple exercise to gauge readability – can you substitute a common phrase for an “insider” term and still have the piece make sense? In instances where you have to use insider terms, consider inserting a brief explanation that doesn’t interrupt the flow and keeps the reader interested. This piece on emerging technologies written for a supply chain trade is a great example. Choose a hot topic. Even editors of the driest trade publications need to attract readers. So it pays to make a topic as “of-the-moment” as possible, while staying relevant to the publication’s editorial coverage. Also key, can the topic be tied to anything in the day’s news? Newsjacking is great for a byline, but only if you can get something written and published before the story reaches its expiration date, which happens quickly in the 24/7 news cycle. Again, pay close attention to the style for each publication and how edgy, or not, you can be with tone and language. It’s helpful to convey as much as possible in the title of the piece so that both editors and audience have a clear idea of where it’s headed. This piece written for a 3D printing company, does just that. Time your pieces strategically. Timing is everything, and coordination of a byline’s publication should be part of an ongoing PR plan. If your company is about to debut a new IoT home security device, time a story submission to coincide with the launch. Consider a broad home security topic that your product can fit into, but not dominate, and offer insight and advice for the reading public. Think about a topic like 5 Ways IoT Has Changed Home Security Forever. A well-timed publication will build on other PR efforts – press release, interviews and product reviews, etc. – and help create even more awareness of the effort. Create a writing track record. Editors of top business publications like Inc. and Forbes are very particular about the writing they select. To convince an editor that you have writing experience on the level they require, build a track record by writing and publishing articles on LinkedIn and your company blog, or guest-blogging on a complementary site. Build a portfolio and start by pitching lower-level industry trades, which are typically in great need of content and have less stringent guidelines. As pieces are published, leverage them up the vertical and business publication foodchain. These examples will demonstrate ability and instill confidence in editors considering contributed pieces. Do your research. This point can’t be stressed enough – there are no shortcuts when authoring a meaningful byline. Do research that includes citing data and statistics to support the case or point being made, or the questions being probed. Quote sources and conduct interviews of third-party experts where possible. Also important – dig deep for relevant statistics and objective data. Check out industry and analyst reports, niche newsletters, and industry experts to lend depth and perspective to the piece and to separate it from “been there, done that” content. Editors are looking for credible contributors who offer unique perspectives that can be supported with facts. Take a look at articles on similar topics and keep a file of the particularly well-written ones that you might “reverse-engineer” to see what kind of research supported the piece. Compile as much background and context as possible before you start writing. Take a contrarian point of view when appropriate. The best articles are the ones with a strong point of view. And sometimes, the less popular point of view stands the best chance of being selected. Take care when taking an oppositional stance, but if it’s true to your core beliefs, a byline championing an unexpected position makes for powerful reading. Tell, don’t sell. Overtly selling a product or service is the kiss of death for editors who make judgments about contributed articles. Submitting a story where you’ve tried to wedge in some sales talk, even vaguely, could result in being blacklisted. So, don’t. Often the only mention of an author’s affiliation is in the actual byline, (the author’s name and affiliation) listed at the bottom of the piece. Sometimes, with an editor’s agreement, a story can include information specific to the writer’s day job, but that’s on a case-by-case basis. If you want to deliver an engaging article, don’t sell. Instead, let the effort and insights of the article work to subtly sell for you. Ideally, byline writing will be part of an overall executive visibility or thought leadership effort that will incorporate provocative ideas, insights and new learnings for a receptive audience while building a personal and corporate brand name and reputation.